Didn’t think the bean brownies I made last time could get any better.. Introducing.. new and improved bean brownies with rich fudgey chocolate frosting. That is healthy. No it’s not avocado. 1. Soak beans overnight or for at least 4 hours. Boil until soft but not mushy. Drain. 3. Process all ingredients in VitaMix/ blender/ food processor until very smooth. 4. Line your brownie pan with parchment paper and pour your mixture in it. This is so that it will be easier to lift the whole brownie up intact. 6. Let cool completely before frosting. 1. Blend soaked cashew, 1/3 cup water/ nut milk, and maple/ agave in VitaMix or a good blender until very very smooth. 2. Add in cocoa powder and salt and blend some more. 3. Combine cornstarch and the rest of the water. Microwave for around 15 seconds until it’s cooked and thickened up. If it is still too thin microwave in 5 second bursts until ready. Add this to the cashew mixture and blend. Pour mixture into a large bowl. 4. Melt chocolate in microwave or over double boiler. Take care not to burn it if using the microwave. It should take 3 to 4 10-second bursts. Stir in between bursts. 5. Now, take one spoonful of your blended mixture (which should be warm from the heat produced in the blending process) and vigorously mix it in the melted chocolate. Mix very well. Then mix in the rest of it. Add more water or nut milk if it is too thick. 6. Let the frosting sit in the fridge for an hour or two before using. 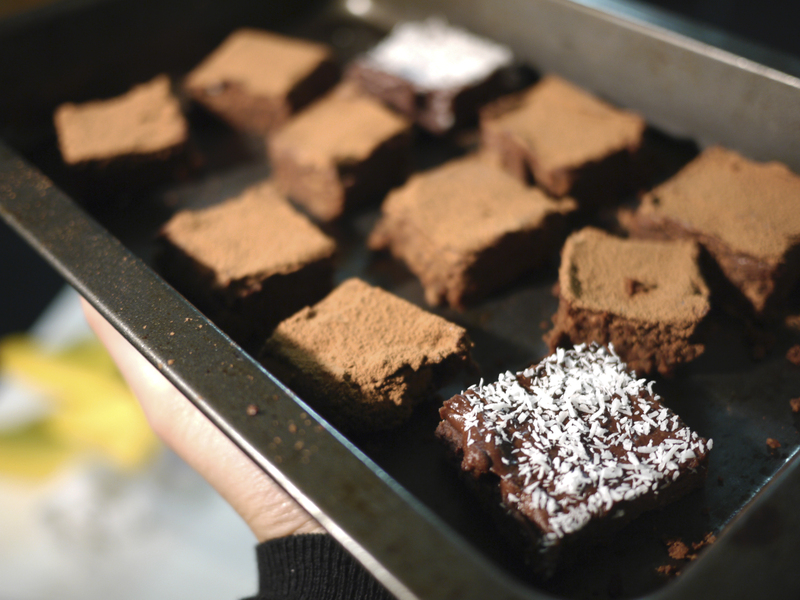 Take your brownie out of the brownie pan by lifting the parchment paper. Spread it across the surface of the brownie and smooth it out with a silicon spatula or an icing knife. Put this back in the fridge to set for an hour. Then you can cut them in squares however big or small you want them. 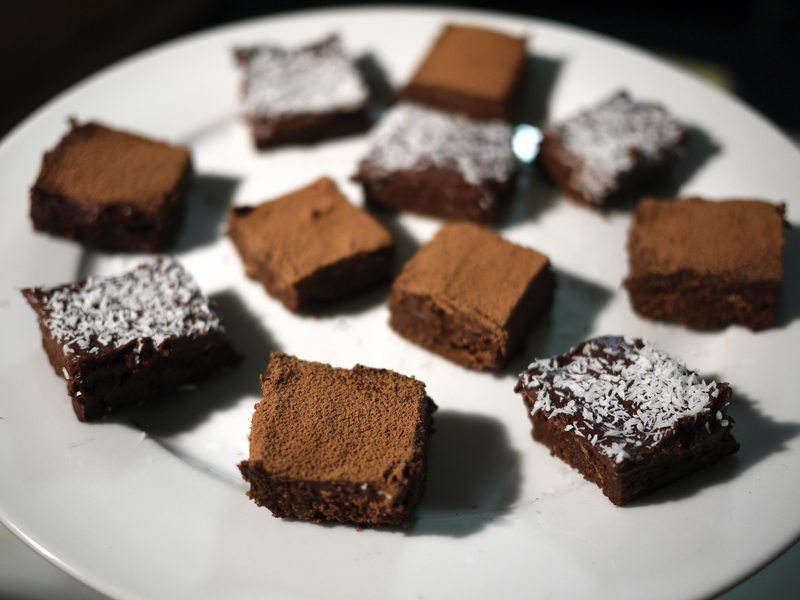 Dust with cocoa powder or desiccated coconut if desired.